This article is about Mr. Game & Watch's appearance in Super Smash Bros. Brawl. For the character in other contexts, see Mr. Game & Watch. Mr. Game & Watch (Mr.ゲーム＆ウォッチ, Mr. Game & Watch) is a veteran character in Super Smash Bros. Brawl, returning from Melee. At first, Mr. Game & Watch was indirectly revealed from a leaked copy of the game. However, he was officially confirmed on the Smash Bros. DOJO!! website on March 10, 2008, one day after Brawl was released in North America. He is currently ranked as 16th on Brawl's tier list in the high-mid tier, which is a high leap from Melee (where he is currently 19th in low tier) and his best placement in the series. The largest benefit Mr. Game & Watch gained in Brawl were the physics changes, where he is significantly less vulnerable to combos, his back aerial is significantly more useful due to hitlag, and the leaning towards defensive gameplay boosts Mr. Game & Watch's strengths in general. For some of his individual traits, Mr. Game & Watch possesses large and disjointed hitboxes in most of his attacks, with his attacks being rather fast in start-up lag and the majority being quite powerful (especially his brutal smash attacks, all of which can reliably KO under 100% while none being particularly slow). Mr. Game & Watch additionally possesses amazing survivability for a character of his weight class, as his amazing bucket braking momentum cancelling gives him the horizontal endurance potential of a lighter heavyweight, while his recovery covers great distance and provides great protection against edgeguarding. Mr. Game & Watch also possesses above average movement speed and good mobility, effective tilts and aerial attacks, and a down throw that can force a tech chase opportunity on anyone at any percent. While Mr. Game & Watch's attacks are fast in start-up lag, they are particularly heavy in ending lag, with his aerials also all possessing high landing lag with the exception of his neutral aerial. His attacks, despite possessing large hitboxes, additionally mostly have poor to mediocre reach. This results in him being easily punished when his attacks are shielded, and complicates safe approaches. His projectile is also laggy and short ranged, while being mostly ineffective, preventing him from being able to outcamp most characters to cover his approaching difficulties. Additionally, he is very susceptible to vertical KO moves as his vertical endurance is among the worst (Bucket Braking is significantly less effective when launched vertically), his grab and throw game is rather poor in general (he possesses one of the shortest reaching grabs and near useless throws outside his d-throw), and his rolls are rather slow while gaining among the shortest distance. Regardless, Mr. Game & Watch's pros outweigh his cons, resulting in overall strong matchups, that are dominating against characters below him on the tier list, while being lackluster against characters above him (particularly losing to eight of the top ten characters, while countered by four of them), and he has achieved above average tournament results. Clear Target Smash!! with 30 different characters on any single difficulty level. Have Mr. Game & Watch join the player's party in the Subspace Emissary (Battleship Halberd Bridge). With the exception of the third method, Mr. Game & Watch must then be defeated on Flat Zone 2. Mr. Game & Watch packs a punch. In general, his attacks possess favorable hitboxes, low lag, and high knockback; however, his roll and dash attack are rather poor. Many of his attacks can hit multiple times. His erratic, instant movement makes him nearly impossible to predict in nearly anything that isn't his approach. Most of Mr. Game & Watch's tilts follow the pattern of his other attacks, being quick and powerful, while also possessing disjointed hitboxes. He has very powerful smashes, two of them hard to punish if they miss due their hitboxes having long duration, and the down smash is very fast. All of them can KO under 100%. Mr. Game & Watch's aerials are powerful, but all of them except for his neutral aerial are laggy, and his neutral aerial doesn't have as much range as his other aerials. His back aerial does large shield damage. Mr. Game & Watch's throws aren't particularly effective, save for his down throw, which can tech chase, and if the player can predict the opponent's rolls, it can be used for an infinite chaingrab (like Snake's down throw). His down throw also allows him to follow up with many moves, like an easy down tilt, a smash, or a neutral aerial (by buffering a dash into a short hop). Mr. Game & Watch is able to negate projectiles easily using Oil Panic (although this only works on energy and electric projectiles) or simply ducking underneath most projectiles. Oil Panic can also easily provide one-hit KOs in doubles if Mr. Game & Watch's teammate possesses an energy projectile. Mr. Game & Watch does have a projectile, Chef, but it is rarely used because of its short range and random trajectory. The move Judge randomly produces one of nine attacks, doing anything from hurting himself (1) to being a one-hit KO (9). His up special move, Fire is a superior out of shield option that can be used to plank. With his Bucket Braking and directional influence, he can be hard to KO despite being the 2nd lightest character in the game (tied with Squirtle). Being both quick and a small target, Mr. Game & Watch can be difficult to hit. Mr. Game & Watch has been significantly buffed from Melee, as he benefits from Brawl's new physics, along with other various buffs. The introduction of hitstun canceling and momentum canceling helps Mr Game & Watch more than most characters as it not only makes him harder to combo but it also significantly improves his endurance mainly due to Bucket Braking. Other new Brawl mechanics such as B-reversing also help him out and the removal of certain Melee mechanics such as L-canceling affect him less than other characters. His shield game has been improved significantly. His shield is much larger and his sidestep is no longer one of the worst in the game. Mr Game & Watch did receive a few nerfs however as some of his attacks are either weaker or are more laggy although he does not have any huge nerfs which significantly hinder him apart from some of his moves (including his down tilt and neutral aerial) losing their KO power in exchange for being faster. Overall Mr Game & Watch is a much more effective character than in Melee although he still struggles against the stronger characters in the game resulting in him being above average. Mr. Game & Watch's outline is brighter and thicker. Mr. Game & Watch no longer makes a noise when getting KO'd aside from his Star KO. Mr Game & Watch's alternate costumes are darker and he has new yellow and baby blue skins. Mr Game & Watch's previous taunt has been moved to his side taunt. Mr Game & Watch has a different animation when carrying heavy items. He now carries them in front of him rather than over his head. Mr. Game & Watch is significantly heavier (60 → 75), though he still remains as the second lightest character, tied with Squirtle. Mr. Game & Watch is slightly bigger, increasing his range, but also his hurtbox. Mr. Game and Watch dashes slightly faster (1.5 → 1.553). Mr. Game & Watch's air speed is slightly faster (1 → 1.081). Mr. Game & Watch's air acceleration is higher (0.02 → 0.07 (base), 0.05 → 0.1 (total)). Mr. Game and Watch's falling speed was reduced (1.7 → 1.24), although relative to the cast, Mr. Game and Watch falls faster. This makes him more vulnerable to combos, but due to his increased weight and Bucket Braking, his survivability is still better despite this, and it gives him better vertical endurance. Mr Game & Watch's gravity is lower (0.095 → 0.07505). Mr. Game & Watch's shield size has been greatly increased, now fully covering his hurtbox. Mr. Game & Watch's traction has been unchanged (0.06). Compared with the returning veterans, however, Mr. Game & Watch's traction is significantly higher, making it easier for him to punish out of shield. Spotdodge has a much longer duration (frames 2-12 → 2-20) and less end lag (frame 33 → 26) making him much less vulnerable after using it. Mr Game & Watch gains much more distance from a glide toss and can now super glide toss. Neutral attack's hitboxes are larger overall (4.8/3.6/3.2u → 5.5/4/3u). Neutral attack's infinite no longer deals consistent damage (3% → 1%/2%/3%). Dash attack's knockback altered (70 (base)/30 (base) → 50/50). Dash attack deals more damage (9% → 11%). Dash attack's hitbox is larger (5.2u → 6.24u), and further in front of Mr. Game & Watch (-4u (X-offset) → 4u). Forward tilt comes out sooner (frame 13 → 10) and has higher base knockback (10 → 20). Forward tilt has less ending lag (frame 42 → 37). Forward tilt has a much shorter hitbox duration (frames 13-30 → 10-15). Forward tilt's angles have been altered (361° → 45°/37°/37°/37°). Up tilt's hitbox sizes have been increased (5.2/3.6/3.2u → 6.5/4.6/3.8u). Up tilt has more startup lag with a shorter duration (frames 9-29 → 13-21). Up tilt deals less damage (9% → 8%). Down tilt has a longer duration (frames 6-13 → 6-15). Down tilt hitbox sizes increased (6.4u (ground)/6.4u (air) → 8/9u). Down tilt's grounded hit deals much less damage (12% → 6%) and has drastically less knockback (65 (base)/100 (growth) → 50/50), no longer KOing even at Sudden Death percents. Down tilt's grounded hit angle altered (85° → 20°), allowing it to set up edgeguards but removing its ability to set up into juggles. Forward smash's weak hit deals 2% more damage (6% → 8%). Forward smash's has larger hitboxes and more horizontal range. Hitbox sizes (4.8/4/2u → 6/5/3u (early), 3.2/2.8/1.6u → 4/3/2u (late). Hitboxes moved forward (16/10/0u → 17/10/0u (early), 12/8/0u → 15/8/0u (late). Forward smash has slightly altered knockback (44 (base)/100 (growth) → 48/98). Forward smash has more startup lag with a shorter duration (frames 13-33 → 17-27). Up smash's knockback growth has been slightly increased (96 → 97). Up smash's ending lag has been slightly reduced (frame 40 → 39). Up smash has an additional hitbox above Mr. Game & Watch's head, noticeably increasing it's vertical range. Up smash's head hitbox size has been increased (5.2u → 6.24u). Down smash has larger hitboxes and more horizontal range. Hitbox sizes (4/4/5.6/5.6u → 4.5/4.5/7/7u). Sweetspots X-offset (-10.8/10.8u → -12/12u). Down smash's sourspot deals more damage (10% → 13%) and knockback (10 (base), 50 (scaling) → 60/68) making it a viable KO option. Down smash's sweetspot deals less damage (16% → 15%) although its knockback growth was compensated (90 → 98). All of Mr Game & Watch's aerials have less landing lag (15 frames → 9 (neutral), 25 frames → 22 (forward), 18 frames → 12 (back), 18 frames → 9 (up), 20 frames → 15 (down). Additionally, the removal of L-canceling affects Mr Game & Watch less than all other returning veterans as he was already incapable of L-Canceling neutral, back and up aerials although the landing lag on his forward and down aerials was not fully compensated. Mr. Game & Watch has a new neutral aerial: Tropical Fish. It's a good multi hit attack that is significantly faster with a longer duration (frames 20-29 → 7-10/12-15/17-20/22-25), deals 1% more damage (16% → 17%), and can be followed up from much more effectively. It also has less ending lag (frame 45 → 35) and can now auto-cancel out of a short hop. New neutral aerial deals much less knockback, no longer being a reliable KO move. Back aerial's multi hits deal less knockback allowing them to connect more reliably with the final hit which deals more knockback. Back aerial deals less damage per-hit (5% → 3%), but has 5 hits instead of 4 (20% → 15% total). Both hits of up aerial come out 1 frame earlier (first hit: frame 7 → 6, second hit frame 21 → 20). It also now has a large windbox above him, giving the move more utility. The first hit of up aerial has a shorter duration (frames 7-16 → 6-7). Down aerial is now a stall-then-fall. Grabs have less startup (frame 7 → 6 (standing), frame 11 → 9 (dash)) and ending lag (frame 31 → 30 (standing) frame 41 → 35 (dash)). Pummel is slightly faster (30 frames → 29) though it is still the slowest pummel in the game. Down throw meteor smashes opponents into the ground, giving it significantly better follow-up options and Mr. Game & Watch a tech chase move. This is especially beneficial considering the introduction of hitstun canceling. Down throw deals less damage (8% → 6%). Ledge attacks now have a new sound effect, which is the same as sound effect used for a Judge #9. Below 100% Ledge Attack is much faster (frame 42 → frame 24). Below 100% Ledge Attack has less invincibility frames (39 frames → 21 frames). Above 100% Ledge Attack has more invincibility frames (53 frames → 59 frames). Chef now tosses other foods besides bacon and also leaves his mouth closed. Chef no longer resets Mr. Game & Watch's vertical velocity. Judge has a shorter hitbox duration (14 frames → 8 frames, 11 frames if Judge 5). Judge 2 now has a 20% chance of tripping targets. Judge "3" deals more shield damage (20 → 25). His Judge "7" will always generate an apple and can only be generated if it hits while on the ground, regardless of item configuration. Judge 8 deals much more damage (4% → 9%), freezing opponents for a longer period of time as a result. Judge "9" now uses a unique sound effect which is a higher pitched version of his up/side taunts. Fire now gives Mr. Game & Watch a parachute to slow his descent. He can cancel the parachute by either hitting down on the control stick or by using an aerial. If he cancels the parachute, it does not make him helpless allowing him to use an air dodge and any move other than another Fire. It also has 9 frames of invincibility starting from frame 5. Mr Game & Watch can now reuse Fire if he is hit with certain low knockback moves after using it such as Mario's Cape or Fox's Lasers. Fire has much more startup lag with a shorter duration (frames 1-37 → 9-29). Mr Game & Watch now suffers from the grab release glitch meaning that he cannot reuse Fire if he is grab released out of it. Due to the introduction of momentum canceling, Oil Panic can now be used to stop all knockback in the air, with a technique known as Bucket Braking. This greatly improves his horizontal endurance giving him greater horizontal endurance than even most middleweights now having the 15th best horizontal endurance out of 39 characters despite being the second lightest in the game. Oil Panic's absorption radius has been significantly increased (5.5u → 22u). Oil Panic's multiplier has been increased (1.5x → 2.8x), it also no longer adds 12% onto the final amount. This means Oil Panic's minimum has been increased to 18% from 12%. Oil Panic's maximum damage now has a hard cap at 60%, meaning Mr. Game & Watch can no longer deal as much as 200% from it. Due to its change, this removes the kamikaze exploit no longer allowing Game & Watch to self-destruct against shielding opponents. Oil Panic's duration has been shortened (frames 2-37 → 2-26). All of Mr. Game & Watch's moves use objects from games in the Game & Watch series, making him the only character to have every single move in his arsenal based on a game he appeared previously before. 3% Mr. Game & Watch rapidly presses an insecticide pump. Excellent for escaping pressure and hard to escape from. Low ending lag; this can lead into a grab or tilt attack. Originates from Greenhouse. 10% Mr. Game & Watch thrusts a chair in front of him, has light potential to KO at very high damages. Some noticeable ending lag. Like his other tilts, it has a hitbox with a long duration. Originates from Lion. 8% Mr. Game & Watch waves a flag above him. Combos into itself with fast fallers and heavy weights at lower percentages. Usually used into a neutral air or up air otherwise, can even KO at higher percentages. At low percentages, can be used for juggling. Originates from Flagman. 6% (grounded), 9% (aerial) Mr. Game & Watch flips a manhole cover in front of him. A very good move to space, especially against characters with low reach. The manhole lid is actually a 3D object, unlike any of his other moves, which are all 2D objects. It is no longer a good KO move as it was in Melee, but it has become more effective at edgeguarding due to being a semi-spike, having good base knockback, a hitbox with long duration, and very low cooldown. Good for anti-air attack; deals more damage if the opponent is in the air. Originates from Manhole. 11% Mr. Game & Watch slides his head along the ground while wearing a helmet. Laggy and easy to predict, a long time to finish, though its hitbox has a long duration. Can combo into moves on fast fallers. Can stage spike if used near the edge, being a effective KO move. Originates from Helmet. 18%/14% (clean head/handle), 8% (late) Mr. Game & Watch attacks with a torch. Great base knockback and even greater knockback scaling as well as lasting longer than expected, making it hard to punish. Has a disjointed hitbox at the end of the move causing very low damage but with good knockback. Usually used after down air, down throw, or up air. Its great knockback scaling and diagonal trajectory makes momentum canceling very ineffective against it. It is arguably the best forward smash in the game as it has good reach and great knockback, being capable of KOing any character under 100%. Though it is a rare occurrence, this attack has a sourspot when only the pole hits. This only happens if a character is small enough to stay between the flame and Mr. Game & Watch himself, touching only the pole. Has slightly less knockback. Originates from Fire Attack. 18% Mr. Game & Watch's head becomes a diving helmet and he bashes upwards with his head, with the hitbox extending a short ways above the helmet. Has noticeable start-up lag, but is the third strongest up smash in the game KO percentage wise (only Ivysaur's and Lucas's KO faster) and it has the highest knockback scaling of any up smash in the game. This is usually Mr. Game & Watch's fastest KOing smash attack, depending on the character and stage. Usually used after up aerial or neutral aerial. Very useful for tech chases due to its wide hitbox and good duration. Originates from Octopus. 15% (hammer), 13% (handle) Mr. Game & Watch takes out two hammers and slams them down on both sides. If sourspotted, this attack is a rather powerful semi-spike and can KO early when on the edge. When sweetspotted, this is one of the most powerful down smashes in the game, being one of the few that can reliably KO under 100%. Very fast IASA, which can surprise people by using it again after a missed one. It is effective at edgeguarding as the semi-spike is powerful and even though the sweetspot has vertical knockback, its great knockback can still KO a recovering opponent. Can combo out of the last hits of neutral aerial and also with down throw on anyone who doesn't have a long enough roll and who doesn't tech it. Originates from Vermin. 5% (hit 1), 4% (hits 2-4) Two fish will come out of both sides of a bowl, hitting multiple times. The last hit has moderate knockback. If the last hit does not hit, it can combo into other aerials and smashes. Its large hitbox and light vertical knockback allows it to juggle very well. Great shield stabber. Originates from Tropical Fish. 16% (clean), 6% (late) Mr. Game & Watch takes out a box and attacks with it. The sweetspot is the initial hitbox with very powerful horizontal knockback while the subsequent hitbox is the sourspot with very low knockback. It can do damage regardless of exactly which side of his body the enemy is hit by. Has the greatest KO potential of all his aerials if sweetspotted. Great for edgeguarding and it can WoP opponents at low to mid percentages. It has long landing lag but its aerial ending lag is not as bad. According to the official melee website, this move originates from Mario's Cement Factory, however the object looks closer to the boxes from Game & Watch version of Mario Bros.
3% (hits 1-5), 3% (landing) Mr. Game & Watch takes out a turtle and attacks behind him. Hits multiple times and has great horizontal reach with a large hitbox. When being shielded, opponents often drop their shields too soon due to the turtle's hitlag causing it to have unexpected duration when it is landed. Can be DI'd out of though. It is possible for grounded targets to powershield the last hit, but this is very difficult to perform. Originates from Turtle Bridge. 7% (hit 1), 9% (hit 2) Mr. Game & Watch raises a pump above him, blowing puffs of air above him twice. It pushes characters above Mr. Game & Watch upwards if they are out of range of being damaged, the wind being more powerful closer to Mr. Game & Watch. This can actually push a player out of Ike's Great Aether, and, when high enough, can push opponents above the upper blast line for a Star KO. The wind hitbox can be used to help teammates with their vertical recovery. Second hit has very high knockback but is very difficult to land due to the wind effect of the first hitbox. Originates from Spitball Sparky. 14% (sweetspot), 13% (sourspot), 6% (landing) Mr. Game & Watch takes out a key and slams it downward. This Stall-Then-Fall attack propels Mr. Game & Watch downwards and is a meteor smash if the initial hitbox is landed and sweetspotted. Can be moved left or right a bit. If used while halfway through a thin platform (after hitting down so he falls through it), he will move upwards and land on top of the platform, without the animation changing. Can perform the Stall-Then-Fall Glitch. Can KO at high percentages, being one of the strongest stall-then-fall moves in the game. Originates from Donkey Kong Jr.
— Reaches out. Short duration. Animation taken from Mario's Cement Factory. 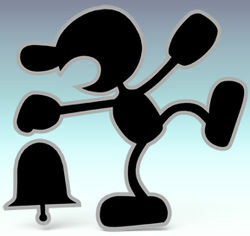 3% Mr. Game & Watch bashes the enemy with an alarm bell. Originates from the Game & Watch's alarm feature. 8% Mr. Game & Watch juggles the enemy as a ball, then the enemy is launched forward. Originates from Ball. 8% Same as other throws, with backwards knockback. Originates from Ball. 8% Same as other throws, with upwards knockback. Originates from Ball. 6% Mr. Game & Watch juggles the enemy as a ball and throws the opponent onto the ground. Can tech chase into an up smash, down smash, forward smash, down tilt, or even neutral aerial. Can meteor smash opponents near the edge. Originates from Ball. 6% Mr. Game & Watch gets out a hammer and slams it in front of him, then behind him. It is very fast. Originates from Vermin. 6% Identical to frontal floor attack. Originates from Vermin. 5% Identical to floor attacks. Originates from Vermin. 8% (bell), 6% (body) Climbs up and hits opponents with a bell, creating an alarm noise. 10% Like his fast ledge attack, but slower. Chef 5% (pan), 4% (food) Shoots flaming pancakes out of a pan. Doesn't have very much use in the metagame, but it can prevent aerial approaches, and is extremely useful for edgeguarding. Judge 2-32% (Varies) Swings a hammer in front of him, and raises a flag with a random number from 1-9 with his other hand. Effects vary based on number, with #1 being nearly useless, while #9 having high KO potential. Fire 6% Jumps upwards off a trampoline, then falls slowly in a parachute. Can be interrupted during the parachute phase by any aerial. Good for starting aerial combos at mid-high percents. Opponents who are close to either firemen will be pushed back a bit. Oil Panic Based on absorbed attacks Puts a bucket in front of him. Absorbs projectiles, and once three are absorbed, turns into a powerful counterattack. Can "Bucket Brake", eliminating all knockback momentum at the time the move was used. Octopus 16% Turns into an Octopus. Damage is dealt on contact and range can be increased by pressing the attack buttons. #1 2% A weak hit with no knockback. Causes 12% recoil damage. #2 4% Another attack with weak knockback. Has a 20% chance of tripping an opponent. #3 6% Another weak knockback attack, although this one causes significant shield damage. Opponents are launched backwards towards Mr. Game & Watch. #4 8% A slashing attack that launches foes diagonally forward. #5 3% (hits 1-4) An electric attack that hits multiple times. #6 12% A flame attack that semi-spikes. Has the second strongest knockback of all Judge attacks. #7 14% A moderate knockback attack that produces an apple if it hits a foe. The apple heals 4% damage. #8 9% A freezing attack with low knockback. #9 32% A very, very high knockback attack that was designed to be similar to the home-run bat. This attack has huge KO potential, being able to KO opponents at small percentages. The attack does, however, have a smaller hitbox. Moves along a row of Game and Watch LCD frames until he reaches the foreground. Up taunt: Rings his bell high. Side taunt: Rings his bell low. Down taunt: Jumps once, opening his hands, in a cheery way. Looks back with an opened mouth. Mr. Game & Watch makes five beeps. As the Game and Watch games did not have music, this track is unique to Brawl. It resembles the bleeping noises and sound effects heard in Game and Watch games. Up: Takes 3 steps to the right, then to the left. Left: Rings his bell to the right, then to the left, then faces the right. Right: Jumps up and down in the air. Mr. Game and Watch has a slightly positive matchup spread. He is countered by 4 characters, soft countered by 5, has 6 even matchups, soft counters 11, counters 7, and hard counters 3. Mr. Game and Watch's oddities as a character help him stand out. He can fight characters that are air based better than ground based characters in most cases, as his fast aerials allow him to beat floaty characters like Lucario. However, he has trouble in the neutral game against opponents like Marth, Diddy Kong, and Ice Climbers, however, because of his inability to camp and approach. He also can't keep up with the options Meta Knight has. Overall, however, he has good matchups. Mr. Game & Watch was at first considered to be a top tier character, ranking as high as 4th place on the first tier list, which is also his highest placing so far. This was due to his disjointed reach, disproportionately high power, great aerial game and Bucket Braking capabilities, which made him very difficult to KO as well as edge-guard, while also being efficient on both points. His position, however, started to decline starting on the second tier list, where he was ranked at 5th place: while he possessed several advantages that made him a formidable threat, his weaknesses later became more and more exploitable. His largest tier drop occurred on the transition to the fourth tier list, dropping from 8th to 12th from the third one. He would later rise negligibly on the fifth tier list to 11th, before starting to drop again on subsequent versions. Currently, he is ranked 16th on the tier list: while he is still a relatively viable character, his notable disadvantages don't let him easily beat other top tiered characters, most notably Meta Knight, Ice Climbers and Marth, though his strengths are enough to face other top and high tiered threats like Pikachu, Lucario, Wario and King Dedede. The Shadow Bugs trophy description explains that Mr. Game & Watch embodies a limitless supply of Shadow Bugs inside of him, which can be extracted incessantly. Shadow Bugs are a substance which can replicate characters or even create new dark creatures. Tabuu discovered this and captured Mr. Game & Watch in the prologue, using the Shadow Bugs to build the Subspace Army. Snake, Meta Knight and Lucario enter the Halberd's control room to discover a gang of Mr. Game & Watches are piloting the ship. Snake quickly charges at them and knocks them all out the window. They fall onto the main deck, interrupting Zelda (disguised as Sheik), Fox, and Peach's tea party. The clones then revert to Shadow Bugs and form into a giant metal monster called Duon. Snake and Lucario jump down to help, along with Falco who ejects from an Arwing. Once the robot is defeated, the Shadow Bugs float away, leaving behind Mr. Game & Watch's trophy. Fox prepares to shoot it with his blaster, but Peach revives it. Upon being revived, Mr. Game & Watch wonders where he is until Peach scolds him for the trouble he created, causing him to look down in shame. Then Peach gives him her parasol to cheer him up. At the entrance to Subspace, Mr. Game & Watch, along with the rest of his team, prepares to attack Tabuu, but is effortlessly turned into a trophy by the Off Waves. He is later revived thanks to Luigi, Ness, and King Dedede. After that, he accompanies the heroes through the Great Maze and the showdown with Tabuu. It was confirmed on the "DOJO!!" that the reason Mr. Game & Watch was manipulated so easily by Tabuu is that he has no understanding of good or evil, despite the fact that Mr. Game & Watch has shown moral behaviour in many of his games. Mr. Game & Watch first appears in Battleship Halberd Bridge and then joins the player's team after, but isn't playable until all the characters are reunited with each other after the events of The Subspace Bomb Factory (Part II), where they then invade Subspace in Entrance to Subspace. Event 32: Bird in Darkest Night: As Falco (with a dark alternative costume), the player must defeat Mr. Game & Watch on Brinstar. The stage gets dark frequently throughout the match. Event 34: All-Star Battle Melee: Mr. Game & Watch is one of the opponents fought in this event. All opponents are newcomers from Super Smash Bros Melee. Event 35: The Visitor to Flat Zone: Mr. Game & Watch must defeat blacked out versions of Peach, Toon Link, and Jigglypuff on Flat Zone 2. Co-Op Event 16: Jigglypuff's Great Comeback: Jigglypuff and Mr. Game & Watch start out tiny and must defeat Lucas and Ness, who are giant, on Castle Siege. During each background change, Jigglypuff will grow while Ness and Lucas will shrink, but Mr. Game & Watch remains the same size. Mr. Game & Watch's main and Final Smash trophies can be obtained by clearing Classic Mode and All-Star mode respectively with Mr. Game & Watch. The monochrome hero of the Game & Watch series, a fellow who oozes personality. First appearing in 1980, the series were the original portable game systems. The first games in the series were quite simple, but as time passed, technology evolved. The multiscreen series featured game play on dual screens. As the name states, the games also kept time. Mr. Game & Watch's Final Smash. He turns into the huge cephalopod that made its debut in the Game & Watch game Octopus. Of course, you can damage enemies by running into them, but you can do more damage by pressing the attack button to extend four arms and launch foes. In the original Octopus game, you had to avoid the octopus while salvaging treasure from the sea. His official artwork resembles his Melee artwork. In Melee, Mr. Game & Watch is the only character who is always 2D in appearance, even in his trophy form. Although Mr. Game & Watch usually appears in 2D, the effect is achieved by flattening a 3D character model. He is also the only character with no textures or shading; he is simply one solid color and outline. Mr. Game & Watch appears 3D, however, when played using moveset swaps. His Subspace clone and Metal Box form also make him appear 3-D.
With Mr. Game & Watch's design originating from characters that first appeared in 1980, he can be considered the "oldest" character in Brawl's roster - which is why he is the first character to be fought in All-Star Mode. Interestingly enough, he is the last character to be fought in Melee’s All Star Mode. While almost all of Mr. Game & Watch's animations use a frame-by-frame style, there are times when he animates smoothly: when being thrown, when being grabbed by Snake, and when using a Cracker Launcher. The first two are due to using animations shared by all characters, while the third is due to the mechanic of angling the Cracker Launcher. Mr. Game & Watch, R.O.B., Olimar, and Samus are the only characters that never talk or make vocal sounds. He instead makes beeping sounds. As a result, Mr. Game & Watch is the only character whose sound cues do not seem to be affected by a Metal Box. Mr. Game & Watch is the only character who does not move when charging his smash attacks. 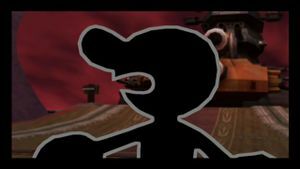 In The Subspace Emissary, Mr. Game & Watch is the only playable character who does not have an immediate presentation screen. When wearing a badge, it hovers in front of Mr. Game & Watch's body, due to being attached to where his body would be if not flattened. When the black costume of Mr. Game & Watch is used on the underground version of Mushroomy Kingdom, he appears to be dark yellow. This could possibly be a reference to the color-changing characters in the original Super Mario Bros.
Oddly, when in Camera mode, the color changes back to black. Mr. Game & Watch and Jigglypuff are the only returning characters who can no longer become helpless via any of their special moves in their transitions from Melee to Brawl. Curiously, the manhole cover (down tilt) is the only item from Mr. Game & Watch's arsenal that is rendered in true 3D while retaining the solid color palette. In Melee, it was rendered 2D, as with the rest of his moves. This unique trait was carried over into his SSB4 appearance. Mr. Game & Watch's Smash Bros Dojo!! This page was last edited on April 4, 2019, at 12:44.